A noise reduction rating indicates the level of sound that earplugs block out when used without simultaneous noise-blocking objects. This rating applies only to earplugs and earmuffs and provides users of these devices an important analytical tool when comparison shopping. The highest NRR rating for earplugs is 33, and the highest available NRR rating for earmuffs is 31. 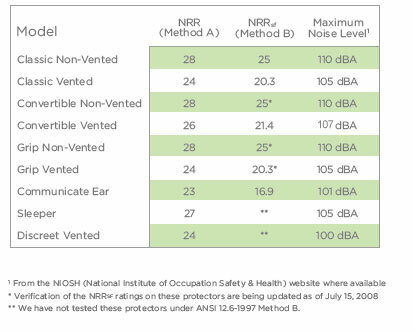 These values reflect the level of noise protection available for each device when worn alone. Combining earplugs with earmuffs can offer a NRR protection level of 36. Manufacturers produce different types of earplugs and earmuffs to reach these ratings. Generally, higher-quality devices that cost more receive a higher NRR rating. Disposable earplugs typically receive NRR rating in the low to mid 20s. Disposable earplugs include wax plugs, foam plugs and most unspecialized, general plugs. Reusable earplugs include specialized plugs such as those manufactured for flying and those specially made for shooting and hunting. The highest NRR-rated earplugs and earmuffs support reuse. How do I use Noise Reduction Rating (NRR) value to determine the protection provided by a hearing protector? NIOSH recommends using subject fit data based on ANSI S12.6-1997 [or most current edition] to estimate hearing protector noise attenuation. There are other single number ratings available. For details refer to the Canadian Standard CSA Z94.2. Another single number rating is based on (Subject Fit) Real Ear Attenuation measurements, known as Single Number Rating (Subject Fit 84th percentile) and abbreviated as SNR (SF 84) (for details see ANSI Standard S12.6). “SF 84” indicates that 84% of the users in a well run hearing conservation program are expected to receive at least that much protection.